Free Spirit Publishing, 9781631981517, 24pp. Being dropped off at childcare or cared for by a baby-sitter means saying good-bye to Mom or Dad—and for many toddlers, bye-bye is a big deal. 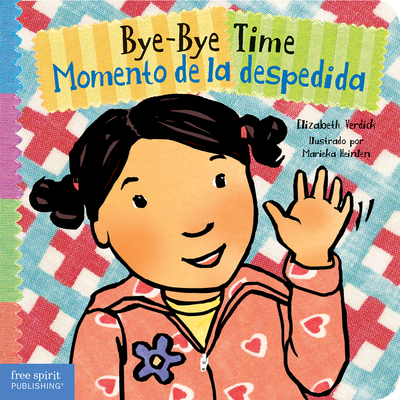 This gentle bilingual English-Spanish board book helps ease the transition and avoid sepa­ration anxiety with simple rituals: hugs and kisses, a big wave, a deep breath, and the confidence to seek comfort with the new caregiver or other children. Elizabeth Verdick has been writing books since 1997, the year her daughter was born. Her two children are the inspiration for nearly everything she writes. She is the author of more than 40 highly acclaimed books for children and teens in Free Spirit’s Toddler Tools, Best Behavior®, Happy Healthy Baby®, and Laugh & Learn® series. Some of her most beloved titles include Germs Are Not for Sharing, Words Are Not for Hurting, Calm-Down Time, Don’t Behave Like You Live in a Cave, Stand Up to Bullying!, and The Survival Guide for Kids with Autism Spectrum Disorders (And Their Parents). She lives with her husband, two children, and a houseful of pets near St. Paul, Minnesota.